Water Fight in Forest Hills! Wow, there really aren’t that many local Fourth of July activities here in Forest Hills. Why is that? I think that should change for sure. 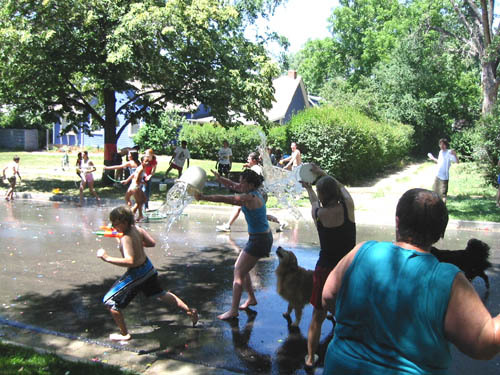 Of all the ways folks celebrate the Fourth, there’s one event that I read about a few years ago that really stuck with me: A neighborhood water fight! Now, before I get accused of promoting anarchy in the streets of Forest Hills, let me explain. Not a bad idea. A crazy water fight on a street closed to traffic, then a softball game and then a block-party picnic. And maybe some fireworks later on to top things off? Not a bad way to spend a Fourth of July, huh? Now would such a small-town event work in the big city? I think it would, after all, we here in FoHi have kind of a small town feel don’t we?